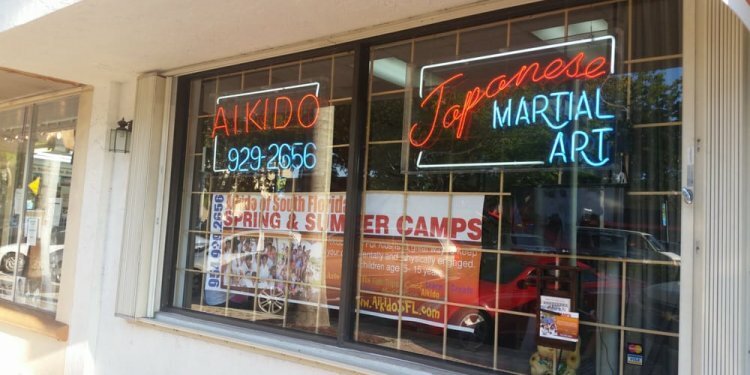 Aikido of South Florida is a Traditional Japanese Martial Art School that has been established in Hollywood for 25 years and is recognized as one of the oldest Aikido schools in South Florida. Aikido of South Florida was founded and is instructed by Stephanie Yap Sensei who believes that the training of Aikido extends beyond the study of techniques for self defense, but rather unifying our mind, body and spirit, our physical and mental prowess, through diligent practice. Our dojo follows the same disciplines taught in the Iwama, Japan dojo, a discipline that Sensei Yap has become quite familiar throughout the numerous years spent as an Uchi deshi (live in apprentice) under the late Morihiro Saito 9th dan, as well as the subsequent years after his death under the guidance of Hitohiro Saito Sensei. Aikido attracts all sorts from all walks of life for many different and personal reasons. Our member's ages range from the age of 5 years to 65, making aikido a very compassionate art that will evolve and mature as timely as the practitioner himself. We have lawyers, doctors, graphic designers, waiters, and cashiers seeking something unique and personal from aikido. Some are in search of stress relief, exercise or the mental discipline. Others will want to focus on the practical martial aspect of aikido, or the camaraderie found though daily training. Regardless what the reasons are for wanting to train aikido, the benefits of Aikido training extends beyond self defense, as it a way to forge and harness your mental and physical conditioning. Daily practice improves your strength, balance, flexibility, coordination of the mind and body, which in essence develops your self-confidence, concentration, character, awareness and compassion for those around you. Aikido of South Florida's aspiration is to preserve the teachings of the founder in the manner that it was taught by instilled by Morihiro Saito Sensei, and to continue the to use aikido as a tool to reconcile the world, a doctrine that was pre-empted by the Founder himself. For several years, Sensei Yap, with the direction, organization and guidance from Gakku Homa Sensei (Founder of AHAN), has been involved in the raising of food, financial aid and supplies to charities around the world. These establishments include Children with Cancer, Children's Burn Center, Children's Orphanages and the homeless. All the proceeds that are raised from Sensei Yap's seminars in affiliation with AHAN are directly provided to the organization delegated. Aikido of South Florida highly emphasizes etiquette and discipline in a traditional dojo environment in hopes of integrating these skills into the practitioner's everyday life by developing the mind, body and spirit. This, in return, promotes better ways of confronting the daily challenges of life. We take great pride in our dojo, and share a passion for the art that has lead us in the right direction thus far. We sincerely welcome the opportunity for others to experience and be a part of our Aikido family.